The Landia AirJet prevents the build-up of odorous material at the Hollandia Dairy. When staff at the Hollandia Dairy, one of California’s oldest independent dairies, noticed an unpleasant odour they soon realised the culprit was the existing mixing system, which was failing to prevent build-up of septic sludge in its 35-gallon bolted steel equalisation tank. The Hollandia Dairy was bought in 1950 by a Dutch couple with dairy experience who had just arrived in the US with their 10 children. From very modest beginnings, the dairy has grown and today employs over 175 people. Since its early days, the company has always strived to be good neighbours, so staff decided they had to do something about the odour problem and its effect on the environment. Local environmental engineering company, ES Engineering was called in to assess what the best solution might be. Carbon filters were introduced, but as the project manager at the time, Christian Tasser, explained this was only a temporary measure: “At Hollandia’s milk processing plant in San Marcos, it was clear to us immediately that this family-owned business cared about the environment and took the situation with its equalisation tank very seriously. Looking for a fast but long-term solution, Christian Tasser sought to maximise the effect of the company’s newly purchased Landia AirJet (chopper pump model MPTK-I 80) by recirculating the foul air from the top of the tank down through the wastewater, thereby effectively scrubbing the sulfur out of the air to eliminate the odour issues. 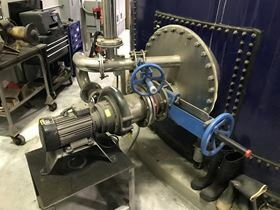 This set-up works along similar lines to the Landia GasMix system that is increasingly being installed for mixing of anaerobic digesters in wastewater treatment facilities and industrial biogas plants. The Landia AirJet used at the Hollandia dairy was sourced through World Water Works, Inc, specialists in the wastewater treatment industry, who also provided installation of the AirJet.